In the wake of the destruction of 5 Pointz, New York's former graffiti mecca, looking back on the best murals of the year feels bittersweet. But the story of 5 Pointz is not a unique one, and many graffiti and street artists have lost their painting spots because of urban development. Still, there are cities across the world, like San Francisco, where murals are key parts of what give them their identities. One thing that stands out in all of the best murals that went up this year is placement, something that may be increasingly on the mind of artists as their concrete canvases become harder to find. Most individuals can paint an exterior wall, but what makes an astounding artist and mural is the ability to create a unique vision, to transform the landscape. Borondo and Axel Void, in particular, worked this year to reimagine how a story can be visually depicted, whether it is the classic tale of Ophelia or a story about a person riding freights to find a new life. 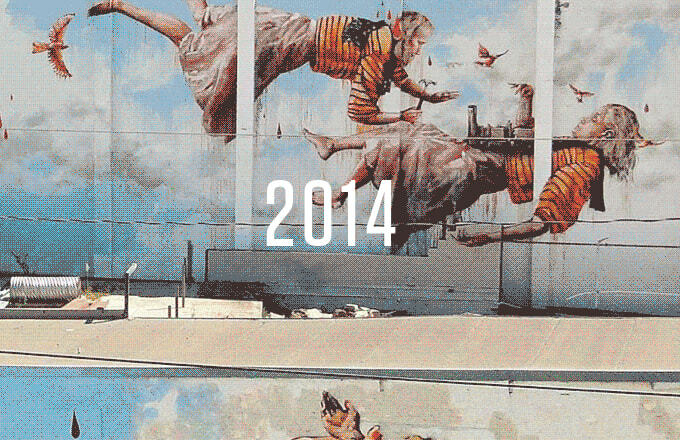 Check out their work and pieces by other street artists in our list of The 20 Best Murals of 2014.